It’s been a busy time here. We go places. We do things. We entertain guests. For a couple of old people we have a busy life. One of the events we enjoy here in Kansas City is the hunter and jumper horse show at the American Royal, Hale Arena. Most of the event is no admission, and open seating. We went during a practice session and saw one horse at a time using the course. 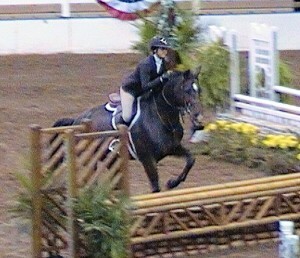 Sometimes the rider would take the horse through the complete course. Other times they would just concentrate on a few jumps, taking two or three attempts to learn the required techniques. 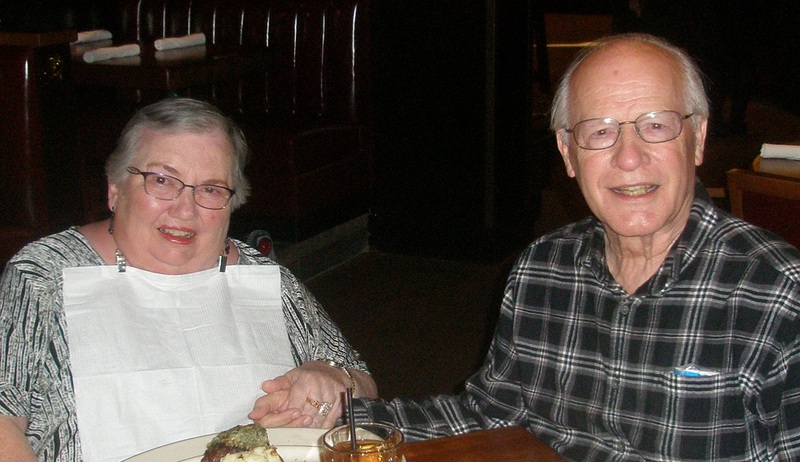 On October 24, we celebrated our 59th wedding anniversary by going to J. Alexander’s for dinner. J Alexander’s knew how to treat us by giving us a card for our anniversary and presenting us with a large piece of their famous Carrot Cake for our dessert. The next night we joined the Life group in celebrating our anniversary by having our favorite dessert, cheesecake with all of them. We chose to celebrate the actual date, October 25, with them. We had a wonderful time with all of the Life group. The Clarks came to visit us from California the weekend prior to my birthday and just after our anniversary. We took them to Independence, Missouri for a brief, but somewhat in-depth visit to Truman territory. We also visited the jail where Frank James spent his last days, and we had lunch at a very nice and authentic German eatery. We were blessed to have our daughter Mellyn come from California for a few days. 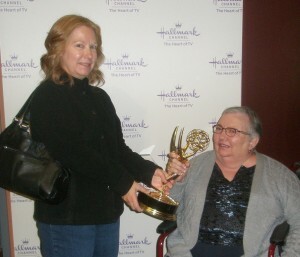 We took Mellyn to the Hallmark Visitor’s Center for a brief visit. We enjoyed the displays, and we actually spoke with a Hallmark artist. While looking at the display of the award winning Hallmark television programs, Mellyn was able to present Marilyn with an Emmy. Yes, that is an actual Emmy. Sadly, though, we couldn’t keep it. 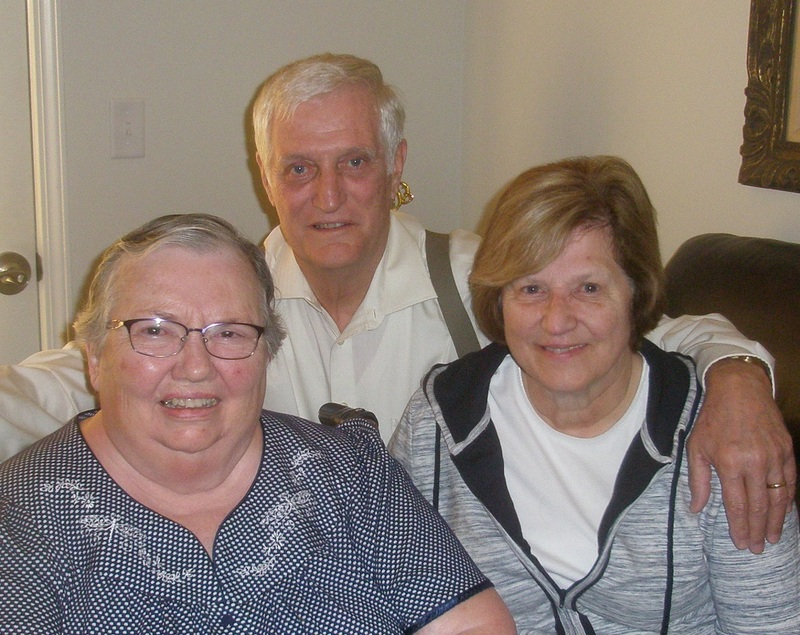 We managed a family dinner so that everyone could meet Aunt Mellyn while she was visiting us. Glen’s brother George and his wife Cathy were here also. We had a wonderful time visiting with each other at the round table. Some of us recalled old memories and it was fun. I think we helped Uncle Matt check out some facts for the tribute he was preparing for Marilyn’s birthday bash. November 4 was the big day. By the way, the birthday bash was started properly by Ken and Harriett Clark who called from Redlands. Marilyn was quite surprised and very pleased at their duet singing. Yes, we had a birthday bash, that’s what Marilyn called it. 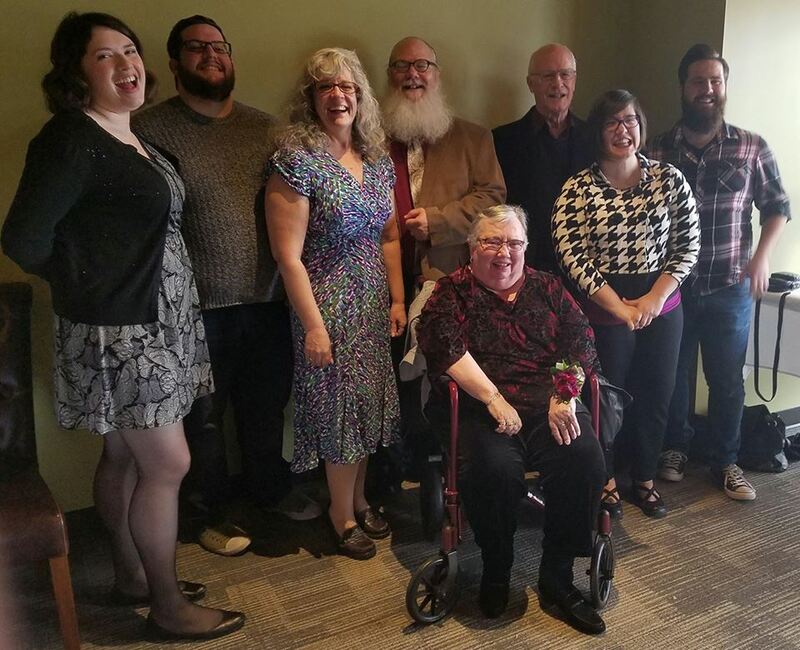 It was a great success as more than 40 people gathered to wish Marilyn a happy 80th Birthday. Matt gave his tribute, (8 books, 80 years, and 800,000 miles) to me, which was beautiful. I received lots of flowers, including a beautiful bouquet of flowers from my neurologist which was lovely. We also got flowers from friends. I received many greeting cards and several gift cards for which I am very grateful. I am feeling quite well and doing quite well. I haven’t had a fall for several weeks, and that is very good! Thank you all for praying for me. I do know that it makes a real difference. Thank you from the bottom of my heart. We’re going to Branson this week and plan to see our friend Bill Welte from Keswick. He’s leading a tour from New Jersey out to Missouri. We are very thrilled to get to see him and other friends again. I hear from my friends there, quite often. This will be an opportunity to see them face to face.